I went to dinner at Il Fornaio in Beverly Hills and then to Ford's Filling Station (Harrison Ford's son is the owner and executive chef) for some midnight madness (free champagne, hats, glasses, all that fun stuff). Fortunately Ford's is walking distance from my friend's house, a definite plus considering the heavy fog that rolled into LA later that night! Too cute! Looks like a BLAST!!! Cute picture! Looks like you had a BLAST!!!! Very fun, what a neat celebrity connection. Your bracelet is great! So cute! The flog was absolutely horrendous! I was way to scared to go out! Love the glasses!! But I kept thinking... what are they gonna do for 2010. We can't have lines going through our eyes! 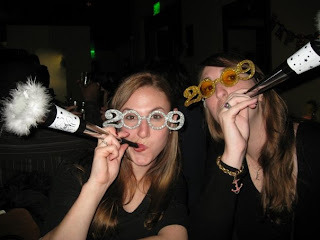 Ooh, loving the glasses & the party blowers! Glad you had fun - Happy New Year! so fun and I'm loving the bracelet! I love Il Fornaio. Their minestrone is fantastic. And the mashed potatoes...so good! J picked the minestrone up for me a few time while I was sick last month. Lovely picture!!! I love the glasses and the bracelet! You look darling, and IOHO, the anchor bracelet is the perfect touch. Looks like fun. Sounds like the fog can be as treacherous as the snow here! Sounds like and looks like a fun night!